The Mushroom Bisque and fries are both infused with Truffle oil which I cannot resist. One of my most favorite flavors on earth. Quickly devoured everything and deemed it time for a proper yosi break to let the starters down before more food arrives. Stepped out for a bit with Ana who always is a darling and accompanies me even if she doesn't carry the nasty habit. To my amazement, Torch has one of the best pizzas around. The gambas pizza is a roll up type that you eat stuffed with arugula and alfalfa sprouts. A definite must try and great for sharing with friends. Torch also serves modern takes on sushi. I believe they are original recipes developed solely for their menu. Both the Volcano Roll and Secret Sushi will leave a delicious lingering taste in your mouth that you will find yourself craving for days after. This is orgasmic, no kidding. The beef is super tender and juicy. It's served on a hot tile which is great for people like me who are slow eaters, maybe just ask for them to serve it medium rare so it doesn't overcook while you eat. The rice also deserves special mention because I don't know why, it just tastes really good and different despite it being just ordinary rice. You have to order this! It's fairly big though so I suggest you share with someone. Also try the Steak Fondue which I don't have a photo of because everyone quickly devoured it a few moments after it was served. Seriously, it was that good. The Panna Cotta is perfect for people who don't enjoy super sweet dessserts. The cream base gives a good balance to the fresh fruit toppings and it has just the right amount of sweetness to get rid of your umay, it's also the perfect size. On the other hand, those who prefer to indulge themselves a little bit more, like me, will fall head over heels in love with their frozen brazo. Still not overtly sweet but slightly richer with it's crumb base, custard and meringue topping, it is heaven in the mouth (no pun intended:) and writing about has me salivating all over again. 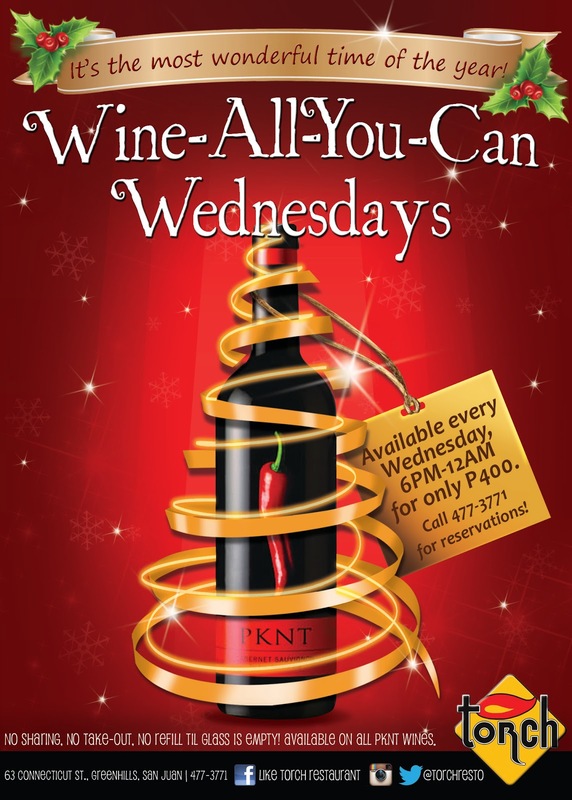 For only P400, you get to drink as much wine as you want every Wedenesday! 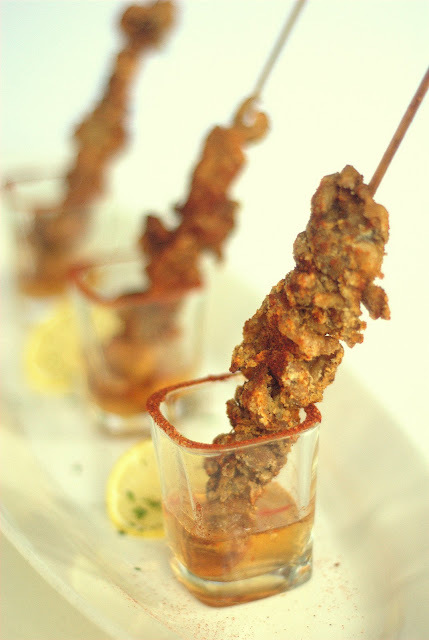 And as a special treat for all my readers, just mention "Pizza-Sushi-Steak" to their waiter to receive this yummy Tequila Lime Chicken Skin Skewer totally free! Call the barkada na and plan your visit to Torch soon!